"Start Taking Advantage of YouTube to Drive Traffic, Build Your Brand, Generate Leads and Boost Your Boat Sales"
I’m going to show you how to drive floods of traffic to your sales team, your website and your showroom floor. Did you know that video views are 64% more likely to make a purchase? I’ll also show you the secrets to getting your videos on the first page of YouTube (and more importantly on Google). This is one area I see almost all in the boat business using video getting wrong! With the insider secrets I reveal - many of my clients have claimed 1st page ranking in as little as 24 hours in their local markets! They were blown away when they searched their keywords… and BOOM there was a boat they had just put up the day before. Implement the simple 3 step process specifically for boat sales in only 27 minutes a week…and reap huge profits! You don’t need to be a technical wizard. No need for fancy equipment. No film background or acting required. All you need is 27 minutes a week, a smart phone and the burning desire to sell more boats today, tomorrow and for years to come. Click below to get started with this guaranteed online marketing and selling system specifically for boat dealers, brokers and sales people. Not only do you get the 15 module, A to Z training course. You’ll also receive $661.95 free bonuses. This program is not just about creating videos. This program is about creating videos that will lead to sales in your boat business. How to maximize the video once created. How to make save time with shortcuts I’ve learned in over 5 years of doing video myself to become a top producing sales person in a 6 location dealership. A little skeptical that you can make this work for your boat business. Skeptical that this program won’t give you solid actionable content. That’s totally normal. That’s why I’ve included a 366 day 100% money back guarantee! Go thru the program. Follow the simple ONE… TWO… THREE system and invest 27 minutes a week doing exactly what I share with you. If you don’t get the results you expected… or feel this course was not for you, no hard feelings. Simple send us an email and we’ll refund your entire investment. To me, that’s just the right way to do business. That’s just my way of thanking you for investing in the NINJA Video Marketing System for Boat Dealers and Brokers. Your boat business needs new leads… you know video is an amazing way to get them… Let me show you how in only 27 minutes a week… plus, a whole lot more to do with video that will blow you away! This was all done with zero marketing budget... and with only me and my smart phone. No fancy equipment. No expensive editing software. no production crew. Just me, a smart phone and a few boats to sell. Yes, it works on new boats, used boats, brokerage boats. 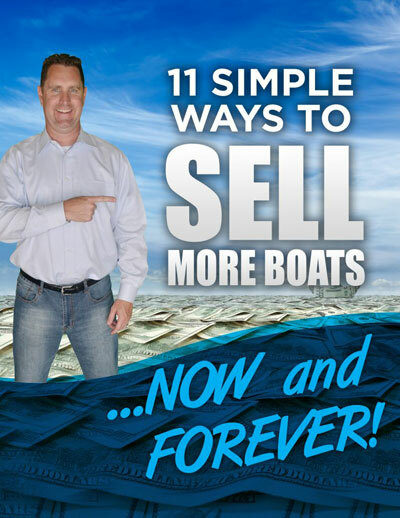 Bow riders, deck boats, pontoons, jet boats, center consoles, cruisers, sport yachts, yachts, aluminum fishing boats, sail boats... and it will work for whatever kinds of boats you sell IF you follow this simple 3 step formula that takes on 27 minutes a week! But, its up to you to get started... don't waste your time trying to figure out what I spent 5 years studying and testing. No need to recreate the wheel... heck, this system will have you selling more boats with online video within hours. And, it is 100% guaranteed, so there is no risk to you. Here's to an ENORMOUS selling season!